Making IT accessible will require input from the disabled, Janet Reno says. 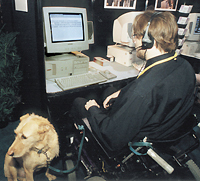 Making government information technology accessible to the disabled will challenge federal agencies, but the effort is necessary because it is the right thing to do, Attorney General Janet Reno said last week. Section 508 of the Rehabilitation Act Amendments of 1998 was a dominant topic at FOSE. The draft rules, issued last month by the federal Access Board, require that IT be accessible to the disabled [GCN, April 17, Page 1]. The rules, which would likely take effect this year, would apply to agencies when they develop, buy, maintain or use IT. In addition to speeches from Reno and Microsoft Corp. president and chief executive officer Steve Ballmer about making technologies accessible to the disabled, the Education Department and the General Services Administration hosted a booth showcasing technologies for disabled users. 'Access doesn't have to cost a lot' when it is built into systems from the beginning and is designed well, Reno said. Video screens, one displaying a transcript of her speech and the other displaying a person signing the speech, flanked the attorney general. The Justice Department last week also issued a much-anticipated report on current federal use of accessible technologies. The report, Information Technology and People With Disabilities: The Current State of Federal Accessibility, said that few agencies are doing enough and that making IT fully accessible would be a challenge for most agencies. Reno noted that the Section 508 efforts would have implications for the government's IT work force shortage. 'It is truly ironic that many [IT] jobs may be ideal for people with disabilities, yet most technology in use today was designed without those people in mind,' she said. Across the board, the most serious problem is not technological, according to the Justice report. 'The most significant challenge posed by Section 508 is the need for coordination between those with technological expertise and those with knowledge of disability access issues,' the report said. The rapid pace of innovation only serves to further complicate the issue, the report concluded. ''To foster communication, President Clinton should issue a Technology Access Coordination Directive to revitalize the Interagency Disability Coordinating Council. ''Agencies should create universal access working groups to serve as advocates for accessible technology. ''Agencies should appoint Section 508 coordinators responsible for making IT accessible. ''Agencies should establish voluntary alternative dispute resolution processes to handle disagreements about IT accessibility. ''Government programs that test and certify software, such as the Joint Financial Management Improvement Project, should incorporate the requirements into their certification processes. At the GSA'Education booth, a FOSE conference attendee tries out the accessible technologies on display. GSA, tapped by the administration to lead Section 508 implementation, is developing educational programs. In demonstrations at FOSE, GSA showcased many products. Zoom Text Xtra from Ai Squared of Manchester Center, Vt., for example, lets users enlarge a portion of the screen, helping those with vision problems. GSA also is working on a Section 508 Web site, www.section508.gov. The agency plans to work closely with Education officials and learn from their experience in drafting accessibility requirements for contracts, said Ron Luycx, project manager for the IT Accommodation Division's 508 Project in GSA's Office of Governmentwide Policy. He said the department also is a model for other agencies that want to gauge product accessibility. Education tests products in its own accessibility lab, Luycx said. For vendors, a key issue will be making products interoperable. Many vendors are rallying behind Microsoft Windows' Active Accessibility application programming interfaces. It sets a baseline from which other vendors can design their applications, said Richard Brown, an Adobe Systems Inc. product manager. Justice's report can be found on the Web at www.usdoj.gov/crt/508/report/content.htm. The Access Board's draft rules for Section 508 are posted at www.access-board.gov/RULES/508nprm.htm.